Many of our patients are understandably concerned about their risk of developing skin cancer. Identifying suspicious moles and other skin growths is important in the prevention of skin cancer. However, it can be hard to determine the difference between a benign mole and one that is potentially cancerous. In this article, we’ll review how to identify and classify moles, as well as provide tips for identifying common warning signs that may indicate your mole is cancerous. Freckles vs moles: What’s the difference? Before determining whether your moles are benign, it’s important to determine if you have any moles in the first place, or if they are simply freckles. While many patients use the two terms interchangeably, there are key differences between the two common skin conditions. Knowing the difference between freckles and moles will help you better assess and understand the condition of your skin. Freckles are concentrated clusters of melanin, the pigment that gives your skin its color. They can result from sun exposure, or they can be genetic. Freckles generally fade with time and become more prominent in the summer, when they are exposed to the sun more often. Freckles are always flat and not raised. Freckles that result from sun exposure can carry a risk of developing skin cancer. Moles are composed of active pigment producing cells, known as melanocytes, that have grown together. They are generally wider than freckles and are slightly raised. The medical term for a mole is nevus, which is Latin for birthmark. Moles are also commonly referred to as beauty marks. Now that you know the difference between freckles and moles, you can begin to identify which type of moles you have. As dermatologists, we classify moles into three main categories. Congenital moles are present at birth and occur in 1-2% of the population. While most congenital moles are not dangerous, larger congenital moles have a greater risk of developing skin cancer than smaller ones. Congenital moles grow in proportion with your body, and may lighten or darken over time. Acquired moles are most commonly developed during childhood or early adulthood, and often result due to excessive sun exposure. Acquired moles are usually smaller than a quarter inch. While acquired moles typically do not carry an increased risk of developing skin cancer, any mole developed after age 50 can be cause for concern. Atypical moles can have many distinct characteristics. Most commonly, they are larger than the size of a pencil eraser, are shaped irregularly, and are uneven in color. These moles are at an increased risk of developing skin cancer. Atypical moles typically develop over time, either from existing congenital moles or newly acquired ones. If you have a mole that you believe is atypical, it’s important that you have it examined by a dermatologist as soon as possible. Early detection is key in the treatment of melanoma, the deadliest form of skin cancer. When detected early, generally in stages one or two, melanoma has a survival rate of over 90%. An easy way to check your moles for signs of melanoma is by using the ABCDE system. If your mole exhibits any of the following symptoms, you should have it examined by a dermatologist immediately. Whether they’re round or oval shaped, benign moles are almost always symmetrical. On the other hand, melanoma lesions are often irregularly shaped, and not symmetrical. One way to tell if your mole is asymmetrical is to draw an imaginary line through the center of it. If both sides match, it’s symmetrical. Unlike the smooth, even borders of non-cancerous moles, melanoma lesions have rough borders that can be difficult to define. Their edges may also be notched or raised. Moles are usually one single shade of brown. A mole that exhibits several different shades of brown, black, or blue can be a warning sign of melanoma. Melanoma lesions can also appear red, white, or colorless in the case of amelanotic melanoma. Moles that are non-cancerous typically have a smaller diameter than those that are cancerous. Melanoma lesions are usually larger than a quarter of an inch in diameter—the size of a pencil’s eraser. If you notice that any of your moles have undergone recent changes in color, size, or shape, see a dermatologist immediately. One of the key factors in diagnosing melanoma and other forms of skin cancer is being aware of these changes as soon as they happen. While moles generally stay the same over time, melanoma lesions can change in shape and size and develop symptoms such as bleeding, itching, or crusting. If you have a mole that looks different from your other moles, it should be examined by a dermatologist. Cancerous lesions often appear to be the “odd one out” when compared to the other moles on your body. For example, cancerous moles may be bigger, differently colored, or oddly shaped. According to The Skin Cancer Foundation, the phenomenon of cancerous lesions appearing noticeably different from normal moles is known as the Ugly Duckling Sign. If you have a mole you’re concerned about, it’s important to have it examined by a dermatologist with a skin cancer screening. During a skin cancer screening, you can expect an examination from head to toe. If you are uncomfortable at any time, the screening can be stopped. During the screening, skin growths and moles will be evaluated, and any suspicious growths will be biopsied. A biopsy is a simple procedure where the doctor uses a scalpel to remove a small amount of tissue. The tissue is then analyzed under a microscope for signs of cancer. If the results from the biopsy come back benign, with no signs of cancer, no further steps are required. We recommend that you continue to monitor your skin for any changes and come in for an annual appointment to ensure your skin remains in good health. If the biopsy shows that the growth is cancerous, we’ll discuss a plan for treatment with you at a follow-up appointment. In cases where the cancer was detected early, a simple surgery may be the only treatment required. At Arizona Dermatology, we’re experienced in treating skin cancer with state-of-the-art methods and medications. 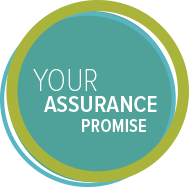 We’ll work with you at every stage of your treatment in a professional and compassionate manner. 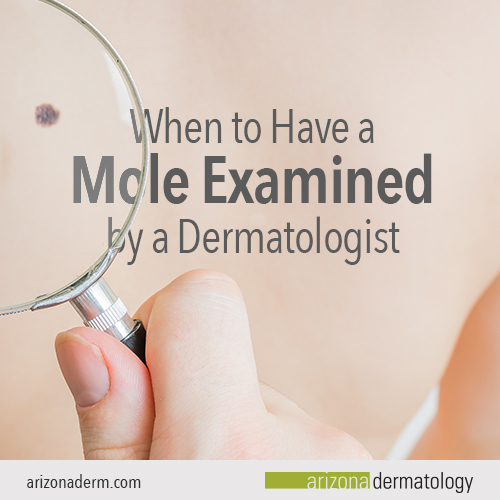 If you have any questions about anything discussed in this article, or want to have a mole examined, we’re here to help. Schedule an appointment today.